I love pesto sauce. Any kind of pesto sauce! But this cilantro pine nut pesto sauce recipe is one of my favorites. It’s delicious over pasta, gnocchi, poached eggs, chicken, tacos – you’ve GOT to try it on my sweet potato gnocchi. The flavors complement each other beautifully! Pesto is one of those really great recipes to have on hand. You can whip it up in almost no time. It keeps for 3-4 days in the fridge and is so incredibly versatile. You can make it with a variety of greens (and nuts if desired). Once you try this Cilantro Pine Nut Pesto recipe, experiment with your own combinations! If you really love cilantro (like I do), try using it in place of the parsley as well. Other herbs that work well here include basil and sage. A splash of fresh lemon juice adds a bright punch too. And, if you’re not really a fan of pine nuts, you can definitely omit them. Pecans or walnuts are a great option as well. 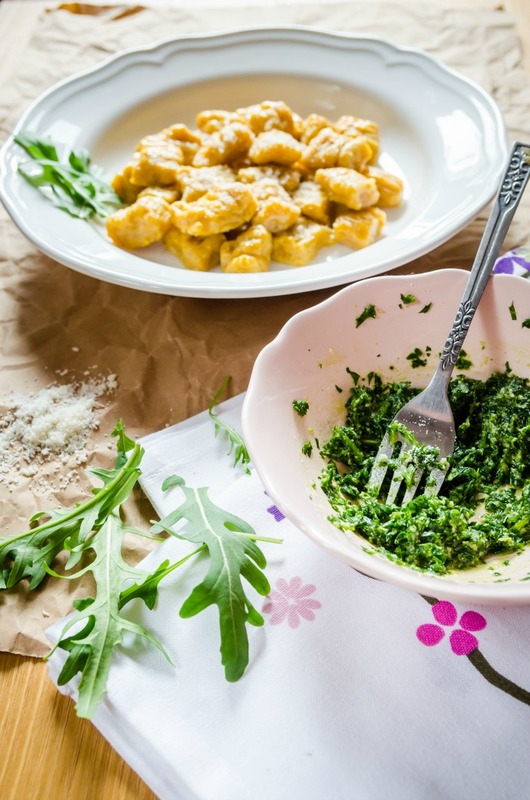 Pesto is such a versatile sauce and so great on many dishes. This Cilantro Pine Nut Pesto Sauce recipe is one of my favorites. Try it on gnocchi, poached eggs, fish, and chicken. Put the cilantro, parsley, cheese, garlic, and pine nuts in a food processor. Pulse to give it a rough chopping. With the food processor going, add in the olive oil, a tablespoon at a time. You may not need the full amount and only want to use enough to bring it together to the consistency desired. Serve immediately or cover and refrigerate for up to a week.